U.S. Marine Corps Sergeant Kirstie Ennis nearly died when the CH-53D helicopter she was flying in as an aerial gunner crash landed in the Helmand Province of Afghanistan in June of 2012. Ennis, who was 17 when she enlisted out of Florida in 2008, thus began her long, debilitating road to recovery, enduring more than three dozen surgeries as she learned how to walk and talk again. In November of 2015, her left leg was amputated below the knee. One month later, a serious infection required an additional surgery, and Sergeant Ennis is now an above the knee amputee. But Ennis’s story has been defined not by her injuries, but her heroic spirit and determination to overcome them. Ennis, who had never snowboarded before serving in the Marines, took up the sport and quickly excelled, with her sights set on competing in the 2018 Winter Paralympics in Pyeongchang, South Korea. She is currently ranked fifth in the world in women’s snowboard cross by the International Paralympic Committee. It was just the beginning of Ennis’s remarkable tale of perseverance. On Aug. 22, she and five other injured veterans began a 72-day, 1,000-mile walk across mainland Britain, organized by a British charity. During the trek, which began in Scotland and ended at Buckingham Palace, Ennis honored 25 of her fallen comrades by placing a commemorative dog tag every 40 miles along the route, each engraved with the name of a U.S. veteran who has passed away. The young veteran is continuing her road to recovery, regularly posting photos of her progress on Facebook with a cheerful attitude. Her story has been covered internationally, by British publications the Telegraph and Daily Mail, as well as People Magazine and ABC News. 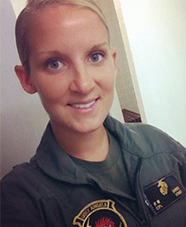 For her service to her country, Sergeant Ennis has earned the NATO Medal, Combat Action Wings with three gold stars, National Defense Medal, Global War on Terrorism Medal, Navy and Marine Corps Achievement Medal, Air Medal, Good Conduct Medal, Afghanistan National Campaign Medal, two Letters of Appreciation, Certificate of Commendation, and a Certificate of Appreciation. Sergeant Ennis will be gifted a mortgage-free home in Colorado.